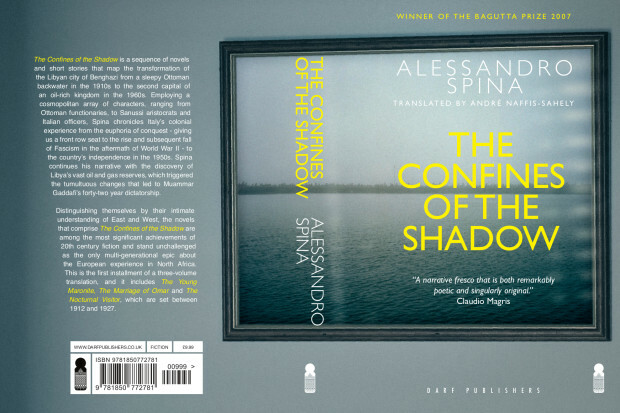 Alessandro Spina’s The Confines of the Shadow: A multi-generational series of novels set in Benghazi from 1912 to 1964. The Confines of the Shadow is a sequence of novels and short stories that map the transformation of the Libyan city of Benghazi from a sleepy Ottoman backwater in the 1910s to the second capital of an oil-rich kingdom in the 1960s. Alessandro Spina’s saga begins in November 1912 with The Young Maronite, which sees Italian soldiers solidifying their control over Libya’s coasts, leaving Libyan rebels to withdraw to the desert and prepare for a war that would last until 1931, when by dint of sheer brutality, including the internment of tens of thousands of civilians into concentration camps, the Italians crushed the rebellion and murdered its widely respected leader, Omar al-Mukhtar. Employing a cosmopolitan array of characters, ranging from Ottoman functionaries, to Sanussi aristocrats and Italian officers, Spina chronicles Italy’s colonial experience from the euphoria of conquest – giving us a front row seat to the rise and subsequent fall of Fascism in the aftermath of World War II – to the country’s independence in the 1950s. Spina finally concludes his narrative with the discovery of Libya’s vast oil and gas reserves, which triggered the tumultuous changes that led to Muammar Gaddafi’s forty-two year dictatorship.